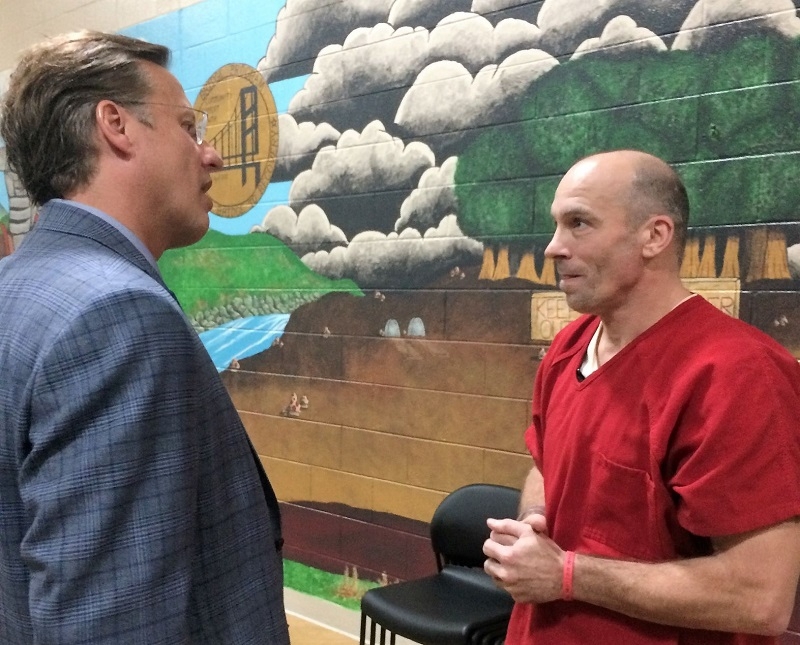 Republican Congressman Dave Brat visited Chesterfied County Jail today (10/17) to hear from incarcerated drug addicts. Many inmates told Brat, who is up for re-election next month, that they wanted more resources as well as changes to sentencing guidelines. Brat offered encouragement and said he was on board with some reform, but pushed for the inmates to find support systems, distractions, and employment. “You have to find some substitute for drugs--get exercise, or academics, reading books, going to the Bible,” he said. The inmates said the punitive damage inflicted by court fines, misdemeanor arrests, and the stigma of their position made recovery that much more difficult. Her story blended with others of inmates who said they’d received punishment rather than help from the government at crucial moments. Brat said he supported some pieces of criminal justice reform packages snaking their way through Congress, though he said programs should be evaluated on a case-by-case basis. He advocated making smaller, incremental changes, including changing laws that suspended driver’s licenses after certain crimes. “It’s bipartisan--most everybody wants this stuff,” he said. At one point, Brat seemed to liken his campaign with the difficulties faced by an addict. After one inmate described the difficulties she would face after release in finding work and stability--and Chesterfield Sheriff Karl Leonard mentioned the need for additional funding for longer-term stays--Brat turned the conversation back to his campaign against Democrat Abigail Spanberger. Watch clip of the extended comment. In an interview after the event, Brat said it was difficult to make a blanket statement on whether the felons in the room should be allowed to vote.